The DoubleTree by Hilton also offers a shuttle service from the SeaTac airport to their facility. With advance notice, they can provide an accessible shuttle. Please contact the Hotel directly at +1-206-246-8600 to request this service. Additionally, if you have limited mobility, please let us know, and you may also be able to wait near the front of the line as well. Each panel room has taped off wheelchair/scooter seating available on a first-come, first-served basis. For our bigger events in the Grand Ballrooms, each event will have marked off seating. If you need accessible seating for one of these events, please let one of our Staff know (they’ll have the headsets or Staff shirts), and they will show you to that seating. Accessible seating is available on a first-come, first-served basis. In addition to the marked off seating, we can also accommodate wheelchairs or scooters by moving chairs. Again, please ask for assistance. Our volunteer lounge does have a separate room that can sometimes be crowded but tends to have a low-key, quieter atmosphere for people to re-charge. Have you not addressed your concern with this FAQ? 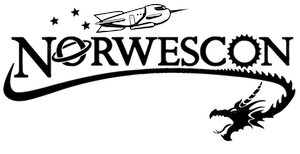 Please let us know by emailing the Chair at chair@norwescon.org with your question or concern. Just because it is not mentioned here does not mean that we cannot potentially accommodate you. 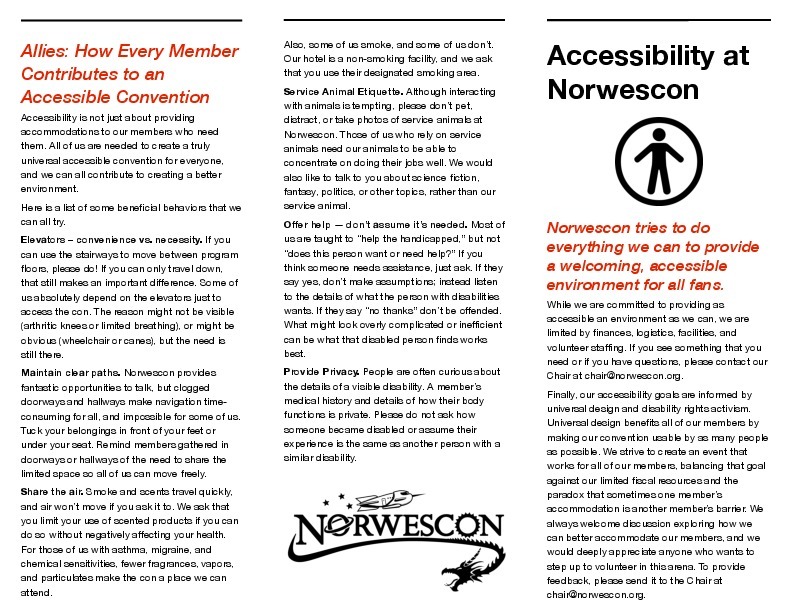 Katharine Bond, “Norwescon 39 Accessibility Brochure,” Norwescon History, accessed April 19, 2019, http://history.norwescon.org/items/show/210.